Use this envelope with our 3-up W-2 forms. If you?re unsure about compatibility, please Requestuest a sample. The security tint and cellophane windows ensure the privacy of information. This envelope is 3 7/8" x 8". 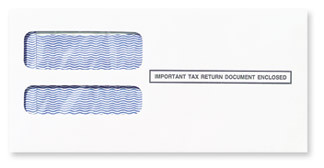 All W-2 envelopes are constructed of 24# envelope stock. Compatible with our forms and nearly all W-2 and 1099 software. Interior tint provides secure delivery.